Transferred 15th March 1916 to the 114th Bty (later 115th Bty). Note: No citation can be found at this stage (worthy of further research). "Born in Sydney in 1892, Albert Biggs, who is said to have disliked being called 'Bert Biggs', was working as a labourer when he enlisted in the AIF on 29 May 1915, using the alias Alfred Briggs. After initial training, Briggs was assigned as a private, service number 1671, to the 2nd reinforcements for 20 Battalion. He left Sydney for overseas service on 19 June, aboard HMAT A61 Kanowna. The battalion trained briefly in Egypt before arriving at Gallipoli in late August, where they defended Russell's Top until they were evacuated to Egypt in December. The battalion moved to France, for service on the Western Front in April 1916. Briggs was promoted to lance corporal on 14 May but reverted to the rank of private on 16 July at his own request. He received a gunshot wound to his left leg on 5 August, during the battalion's first major action at Pozieres, and was evacuated to the 3rd London General Hospital. Two months later Briggs was discharged to the 5th Training Battalion, where he remained until he rejoined the 20th Battalion in France on 19 February 1917. He was promoted to lance corporal on 23 March. On 15 April Briggs was awarded the Military Medal for 'great initiative and bravery', at Lagnicourt. Briggs was severely wounded during the second battle of Bullecourt, on 5 May, sustaining a penetrating shrapnel wound to his left knee and a severe fracture of the humerus, just above his right elbow. He was evacuated to the 6th Field Ambulance, then to a casualty clearing station, and finally to the 1st Australian General Hospital at Rouen, where he remained until the end of April 1918. On 29 April he was transferred to England, to the Tooting Military Hospital in London. In July Briggs was sent to 1 Australian Auxiliary Hospital at Harefield, suffering from disability and a mental condition, to prepare him for his return to Sydney in September. He spent nearly two years at the 4th Australian General Hospital (4 AGH) at Randwick, and convalescent homes, before his discharge from the army on 7 July 1920. Brigg's wounds permanently fused his left knee, and so damaged the nerves in his right arm that he had very little function in that hand. He was encouraged to take up embroidery as a means of both passing the time and of 'training' his left hand in fine motor skills. This example is thought to have been completed while he was at 4 AGH. While he was in hospital Briggs' wallet and Military Medal were stolen from his bedside locker. 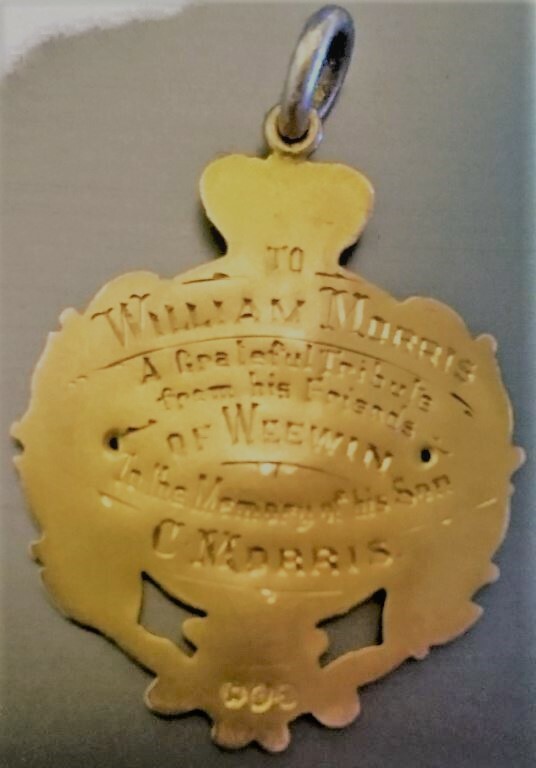 A new medal was issued to him, correctly named at his request to 'Biggs'. Note: G. J. A. Long was born in Sydney, Australia, in 1894. He enlisted in the Royal Army Service Corps in New South Wales, 10 July 1916. Having embarked for the UK in November 1916, he arrived at Devonport in January 1917. He was drafted to the 45th Australian Infantry Battalion, A.I.F., and served with them in the French theatre of war from March 1917. Long was twice wounded in action, including a gunshot wound to the shoulder and right arm on 30 May 1917, and a severe gunshot wound to the left arm on another occasion. He was discharged in Australia in May 1919. 2nd WIA: 26th July 1916 (G.S.W. Buttock). 3rd WIA: 31st August 1918 (S. W. Head and also written as S.W. Left cheek) wound received whilst earning his Military Medal. There is confusion between his first two wounding’s and he appears only credited with two wounding’s. This is contradicted as he is taken back on strength between the dates. Note: Tragically Harry Batchelor was swept off the rocks at Bondi Beach whilst fishing and subsequently drowned on the 22nd of March 1925. A well-known local cricketer by the name of James Verner Garner (who is the only man ever to bowl out both Victor Trumper and Don Bradman) attempted to rescue him but was washed on to the rocks several times whilst trying to save him. Newspaper articles at the time hint towards Garner being awarded a medal for the attempted rescue (further research required). This medal is partly erased with 70 percent still clearly visible. The fact that so much remains could be wear to the edge on what was a shallow striking and not done with any malice (see photos). Pair: British War Medal and Victory Medal both correctly impressed LIEUT. G. W. KEELER. A.I.F. Also entitled to Military Medal and 1914/15 star. Died of injuries on the 31st August 1918 caused by a motor accident (fractured skull). This was whilst on active service behind the lines in France and he was taken to the 4th Field Ambulance and then to the 53rd Casualty Clearing Station where he died. Group 2; Pair: 1914/15 Star and Victory medal (missing British war medal). Both correctly impressed to 3419 PTE C. MORRIS 14/BN A.I.F. PAIR: British War and Victory Medal, both correctly impressed to 1576 L/CPL T. KELLEHER 9 BN AIF. RTA: 4th May 1915 for reasons unknown (due to this part of the file missing). The 9th Battalion was in the initial waves at the landing at Gallipoli and by the 4th May it is possible that slightly wounded or stable wounded could have been sent home to recover (depending on the wound). There is no reference to a charge appearing later on in his service and a wound or injury seems the only likely event that once recovered would carry no prejudice on re-enlistment. Taken on strength at Lemnos on the 31st October 1915 heading for Gallipoli. We can only assume he reached Gallipoli with nearly two months left of fighting before the evacuation and the next entry in his records show him disembarking at Alexandria on the 7th of January 1916 with the rest of Gallipoli’s evacuated force. KIA: 25th October 1917 Belgium. Unfortunately no body was recovered for Thomas Keleher and he is remembered on the Menin Gate Memorial. When searching records for Thomas Kelleher he may appear under his second number 2487 and the family surname is spelt with one “L”. Missing 1914/15 star based on previous enlistment. On the surface he was a very interesting man and hopefully with good research his full story will be discovered. Note: Entitled to 1914/15 star, however the pair was re-united recently (2018) giving hope that the 1914/15 Star will eventually turn up. A note that came with medal indicates he died in 1930 with the official records stating “died after discharge”. RTA: 8th September 1918 reason given "G. S. W. Left foot amputation of Great Toe". It appears his previous wounds have got infected and Private Player is very sick leading up to his discharge. Note: The 18th Battalion landed on Gallipoli on the 22nd August and went into action almost instantly on “Hill 60” and it is here where Private Player was injured. Pair: 1914/15 Star and British War medal (missing Victory medal). Both correctly impressed to 513 PTE B. BOOKER 27/BN A.I.F. RTA: 19th January 1916 discharged “Medically Unfit” 4th M.D. Pair: 1914/15 Star and Victory medal (missing British war medal). Both correctly impressed to 618 PTE V. C. RYAN 29/BN A.I.F. RTA on the 17th March 1917 and was discharged medically unfit due to his wounds. Note: On the last page of Vincent Charles Ryan’s records is the stamp showing a medal returned in 1923 (and no stamp showing that any medal was re-sent as per regulations). As we are in receipt of the 1914/15 Star and Victory medal, this would imply that the British War Medal was not issued. 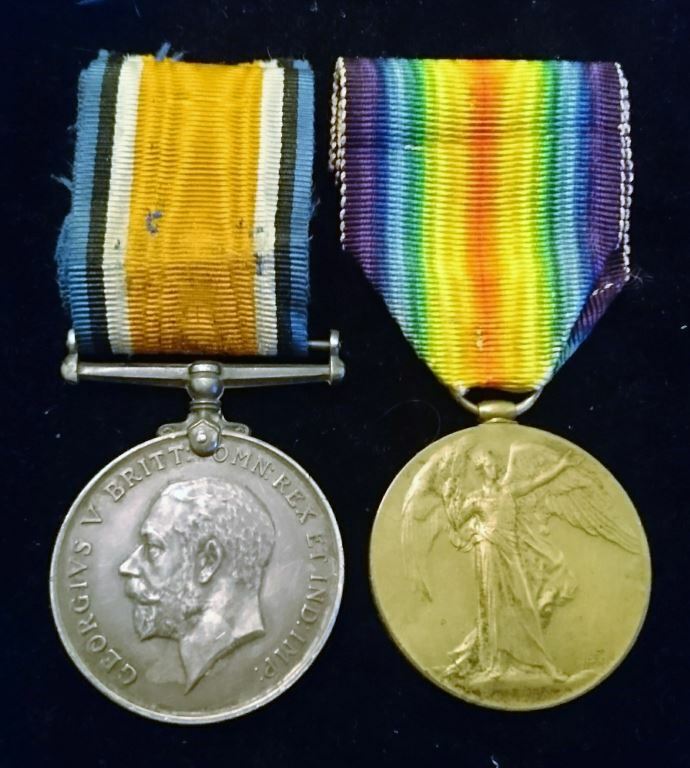 Pair: British War Medal, Victory medal (missing 1914/15 star). Both correctly impressed to 1411 A/CPL L. H. SHAW 1 L. H. R. A.I.F. Pair: 1915/15 Star and British War Medal (missing the victory medal). Both correctly impressed to 997 SGT T. TURNER 1/BN A.I.F. Previous service recorded as "6 years Irish Guards, purchased discharge"
WIA 6-9 August (G.S.W. Left arm) one record states "Shoulder , Lone Pine 6th Aug. 1915"
Discharged 6th December 1917 as Medically unfit. Interestingly Sergeant Turner was wounded at the time of the two Victoria Cross actions of Shout and Keyser of the 1st Bn. Both Victoria Cross actions involved Grenades and further research may connect him to these actions. Sergeant Turner never re-entered the field after being wounded at Lone pine. Pair: British War Medal and Victory medal (missing 1914/15 star). Both correctly impressed to 1349 PTE W. J. THORP 5 BN A.I.F. A letter applying for the ANZAC Medallion (in his records) by Private Thorp himself states that he was at the landing on the 25th April 1915 and was further wounded at Gallipoli where he ended up on the Destroyer "Reindeer" and remained for some time "to help the British". Total war service is recorded as "4 years and 185 days". Pair: 1914/15 Star and Victory medal (missing British war medal). Both correctly impressed to 890 PTE E. J. CHANDLER 11 L. H. R. A.I.F. Returned to Australia 3rd August 1915 classed as medically unfit with no mention as to why? Re-enlisted for deployment 12th April 1916, now under service number 4294 with the 57th Bn. Private Chandler is accidentally injured "Tibia & Fibula" (ankle) severe on the 4th February 1917 "slipped while carrying bombs". Board of enquiry found him not at fault. RTA on the 24th August 1918 and was discharged as medically unfit 20th October 1918. It appears that after his injury, he never quite healed. RTA. 12 December 1915 Medically unfit. Pte. Hamilton is recorded as being wounded on the 8th of May 1915 which is where the 8th Battalion was involved in Krithia. An extremely important yet tragic early battle in the Gallipoli campaign. 12th August 1915 Pte Rooke is taken off the Peninsular with "Septic hands" after Lone Pine and is classed as "Mental"
This soldier was one of "Jacka's Mob" who obviously suffered greatly during the heavy fighting at Lone Pine. Important note; Victory Medal was returned to sender and never re-issued. Great early fighting group from the landing to the hugely significant Quinns post. Pair: 1914/15 Star and Victory medal (missing BWM). Both correctly impressed to 541 SJT (LIEUT. on Victory medal) H. T. CROUCH 16 BN. A.I.F. WIA 27 April 1915 (G.S.W left leg). Despite this he is not discharged until 10 January 1919. Another very interesting group to a casualty in the first few days of the landing and then on to become an officer. Pair: British War medal and Victory medal (missing 1914/15 Star). Both correctly impressed to 2613 A. W. DUCKWORTH 18 BN. A.I.F. Pair: British War Medal and Victory Medal (missing 1914/15 star) all correctly impressed to 5689 DVR A. A. MACULLY 3 F.A.B. A.I.F. A curious entry stating "Injury to head" on the 16th March 1916 in Cairo, but no further information. 9th May 1918 admitted to hospital with "Trench Fever"
D.O.W. 23rd October 1918 Taken to the 55th Casualty Clearing Station with "G.S.W. thigh" in Tremont, near Bohain (France) where he succumbed to his wounds (See photo for extract from his Red Cross file). Buried Premount British Cemetry (Plot I, Row A, Grave Number 7) France. Note; Private Macully also sometimes appears as "McCully"
Memorial Plaque. Correct one piece cast named to John Shevland. The sinking of the R.M.S. Lusitania on the 7th of May 1915 by the German U-boat U-20 is seen as one of the most important events in WW1 and is often argued as the reason America entered the war. Period reports give the casualties of the Merchant Marine at roughly 400. Considering the amount that would still be with families, on graves or in museums, makes this culturally important and rare. Note: There is only one "John Shevland" listed with the War Graves Commission, so there can be no doubt that this is his. Pair: British War medal and Victory medal (missing 1914/15 star). Both correctly impressed to Captain D. MCCALLUM A.I.F. 29 February 1916 transferred to 51st Bn. KIA 3 September 1916 Mouquet Farm. An extremely important grouping from the landing at Gallipoli with the 11th, to being killed as the O.C "B" Coy in the attack on Mouquet farm. Pair: 1914/15 Star and British War medal (missing Victory medal). Both correctly impressed to 28 PTE C. E. F. RUSHBROOKE 1/ A. N. & M. E. F. (DVR ON BWM). Emb. 11 August 1914 with the AN&MEF expeditionary force to German New Guinea. Charles Rushbrooke was previously a constable in the NSW police, despite this, he continuously gets in trouble and on one occasion was "Offering violence to a person in whose custody he was placed". He also appears to have three nurses writing to him (national archives). 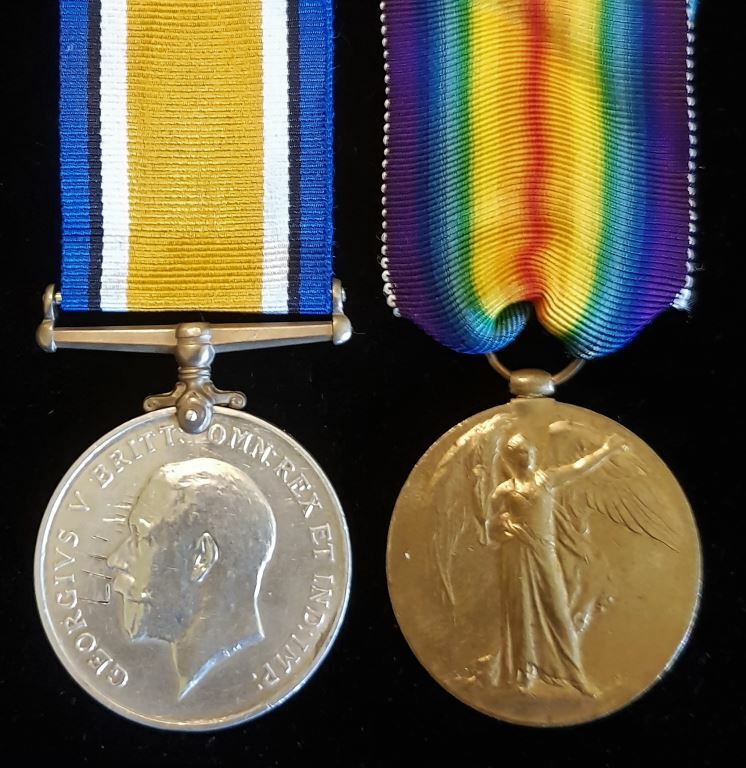 Pair: British war medal and Victory medal impressed to 1942 PTE H. R. GANNONI 10 BN AIF (missing 1914/15 star). Memorial Plaque. Correct one piece cast named to James Martin Keleher. 2696 Private James Martin Keleher embarked in November 1915 with the 3rd Battalion AIF. Private Keleher was sadly only 18 years when he fell. 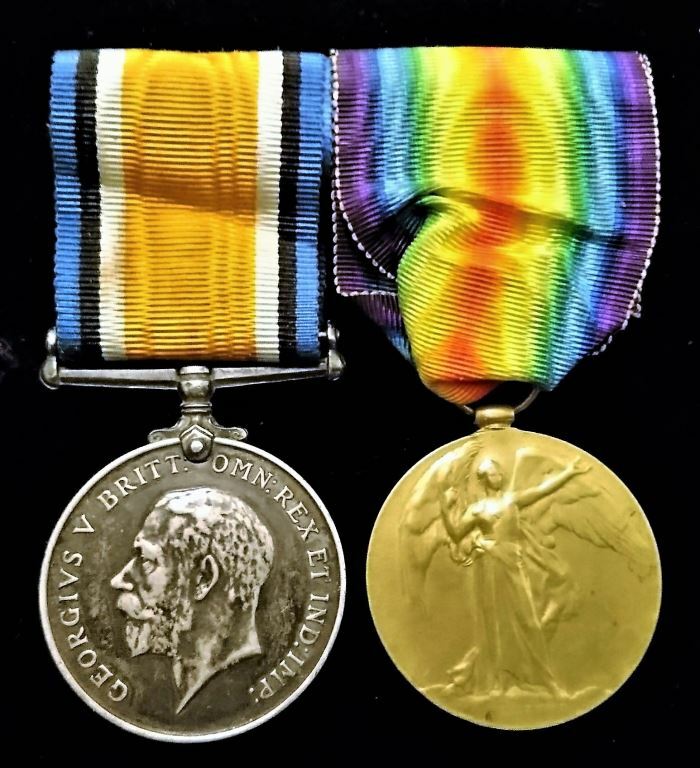 Four: 1914/15 Star, British War Medal and Victory Medal.1914/15 Star and Victory Medal impressed to 1178 PTE W. W. STANGER 11 BN. AIF (48 BN on Victory Medal). 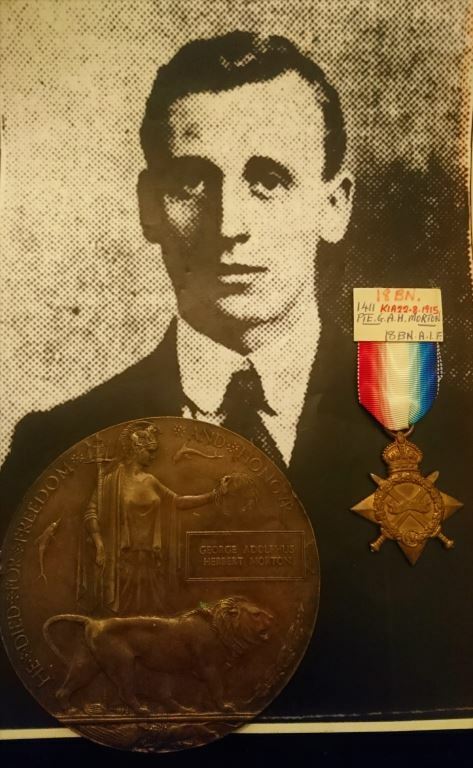 British War Medal is named to 2631 Spr J. Stranger R.E. (brother?). Death plaque named Walter Wright Stanger. Records show that Pte Stanger was killed instantly by "Machine gun bullet to the head"
This group appears to be the classic family mix up either not realizing the medals are named on the edge or just wanting a representative of both brothers. Note: It must be remembered that at Quinns Post and Hill 60, the 13th was well under half strength. Private Collins, not only took part as one of the few, but was wounded and then gave his life at Hill 60. 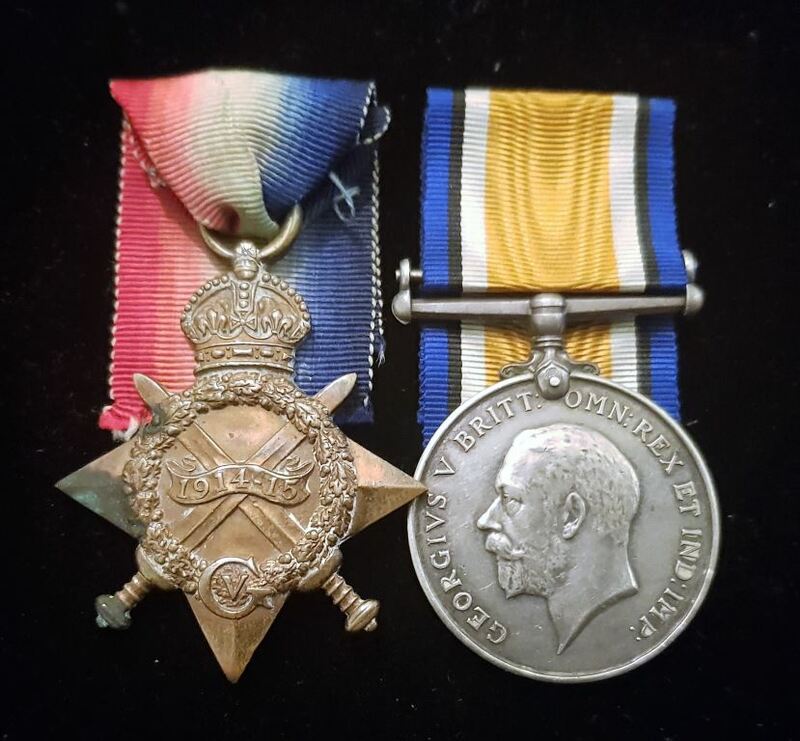 Pair: 1914/15 Star and British War medal (missing Victory medal). Both correctly impressed to 1665 PTE S. V. DONNELLY 1/BN A.I.F. WIA. 15 August 1915 (S. W. right arm and leg). Reported as "Dangerously ill" and he is not "out of danger" until 11th October 1915. RTA. 24 June 1916 Med Discharge. Pte Donnelly was wounded at Lone Pine and a good researcher may be able to connect him to the Victoria Cross actions of either Shout or Keyser of his Unit. Both Victoria Cross actions involved Grenades of which Pte. Donnelly's injuries appear to be. His wounding is first reported as the 15th but most likely occurred days prior.